Directors: D. Jud Jones, Risto Topaloski. Voices: Mark Keller, Bettina Devin, Roger Jackson, Jeff Atik. 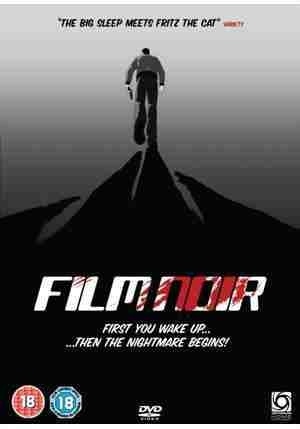 Being an avid fan of the film noir genre, I couldn’t resist one that used the genre’s description as it’s title and also carried an 18 certificate, making this an enticing prospect for any hardboiled fan, not to mention that it’s an animated take on it. Waking up in the Hollywood hills without a clue as to his identity, our protaganist finds himself with a dead police officer lying next to him and the murder weapon fitting his holster perfectly. He determines that it must be himself that’s the murderer. But he has no idea of who he is or why he’s killed. He sets out to unravel the mystery of his identity while crooks and dames try to thwart his investigation at every turn. For me, one of the major attractions to this film was the animation but unfortunately, that was also the biggest disappointment. It’s nothing special by today’s standards, and bordered on amature at times. The splashes of colour throughout were a nice touch though, in a mainly monochromatic style. What really raises this above the standard is it’s perfect attention to the atmosphere of a noir, with excellent use of downbeat voiceover and sleazy saxaphone and trumpet jazz soundtrack. It doesn’t quite manage to hold your attention throughout though, partly down to the substandard artwork and the fact that it goes way over a reasonable running time – meandering towards it’s conclusion. Comparisons with Frank Miller and Robert Rodriguez’s “Sin City” will no doubt be made, as this is the best example of what to expect from this unexpected genre addition. The opening is so strong that the rest of the film suffers because of it. If you’re a fan of the film noir genre you’ll find plenty to enjoy, but it somehow left me feeling that this was a missed opportunity for something unique and special. This entry was posted on January 29, 2012 at 12:58 pm and is filed under Animation, Film-Noir with tags 2007. You can follow any responses to this entry through the RSS 2.0 feed. You can leave a response, or trackback from your own site.